For this card I used Power Poppy's Geraniums Digital Stamp Set for the main image and Dancing with Daffodils for the sentiment. I colored my flowers with Prismacolor Pencils and created a striped background by painting worn lipstick distress oxide on cream paper. Shopping Our Stash - Get Krafty! A very pretty summery feel to your card, many thanks for joining in with our 'Flowers all Over' theme at Allsorts challenge. A super image and background, really like the way you have placed the sentiment to hide some of the leaves so that the attention is more on the flowers than the leaves. Great colouring. 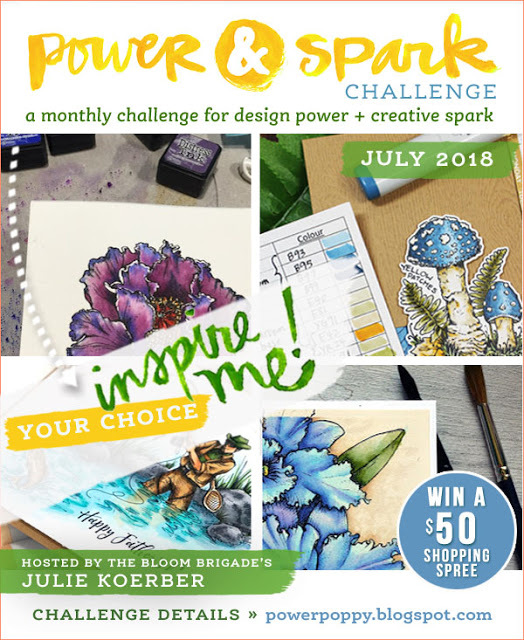 Thank you for joining our 'Flowers all over' challenge at Allsorts. Beautiful, I love how you did the stripes background and the flower is terrific! Lovely card, beautiful colouring on kraft, love the geranium stamps too. Love this Power Poppy image, you colored it beautifully with your Prismacolors, the background is so beautiful too. A tag and card in one! Love the pretty soft colours!